December 11, 2014 December 15, 2014 Nefer Khepri, Ph. 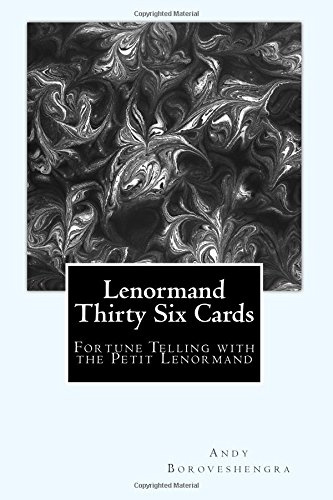 D.
Lenormand Thirty Six Cards: Fortune Telling with the Petit Lenormand. The version I review here is the PDF e-book. I have not seen the paperback edition. Lenormand Thirty Six Cards is written in a clear and easy to understand style. It is obvious when you read the text that Andy Boroveshengra is a seasoned teacher of Lenormand. He maintains a balance of addressing readers who are brand new to Lenormand with more experienced readers as he shares his methods of reading the cards. Exercises are included throughout and I encourage you if you’re serious about learning how to read Lenormand cards that you do every exercise. They will help tremendously. People new to Lenormand will find his book to be fairly easy to follow while those who already work with Lenormand cards will no doubt learn a few things as I have. The PDF has 142 pages and there are full color illustrations of the cards throughout for easy reference. Cards used are the 1880 Dondorf. What I particularly appreciated about the illustrations is the use of red arrows and lines superimposed on the cards for the section on how to read the Grand Tableau, which uses all 36 cards. This will be most helpful to those new to Lenormand and will most likely aid in clearing up some confusion for those who have already discovered Lenormand. These days increasing numbers of books about Lenormand card reading are being produced and you may well wonder what makes this one any different from the rest out on the market. Firstly, Andy Boroveshengra is highly qualified as a Lenormand reader and scholar. I have seen him repeatedly exhibit a very impressive knowledge of original Lenormand sources that he has mentioned on his blog as well as on social media. He bases his knowledge on original sources and this comes through in his writing as well. Secondly, Andy Boroveshengra learned Lenormand from his Aunt Elise. She was illiterate and he has no information on who would have taught her. Andy was also taught Lenormand reading methods by a French woman named Euphemie Al Ansari. His grandmother and mother practice palmistry, which they both have taught to the author as well; and, Andy’s mother also reads playing card tableau as did her mother before her. Andy uses a number of her reading techniques and through his own work he is passing along his family’s knowledge. The author’s substantial background in the field contributes to the reliability of Lenormand Thirty Six Cards as an accurate source of information. The author adheres to traditional card meanings and includes tried and true methods of interpretation. Lenormand Thirty Six Cards begins with a discussion of the meaning of each card. The card title, playing card association, and keywords open the discussion of each card’s meanings. In addition to the main meaning of each card additional meanings are provided and the author often discusses how the meaning can vary based upon adjacent cards. Health meanings are also included for each card. The next section deals with “Card Themes,” which is akin to card meanings, but here the focus is on areas of life that are represented by the cards. This chapter is organized according to theme. Themes include: Communications, Love, Family & Home, Happiness, Work, Finances, Warnings, Sickness, Trouble, & Animals. The following section breaks the cards down into Positive – Neutral – Negative classifications. This is most useful so that when a new reader lays the cards they can scan their reading quickly to get the overall feeling of their reading. Lenormand Thirty Six Cards continues on with a discussion of the people cards. The obvious people cards are the Man and Woman cards, but other cards; such as, Snake, have court card playing associations so they are also included in the discussion of people cards, but Andy Boroveshengra points out he does not include the Jacks as people except for the Jack of Spades that is on the Child card. His emphasis is on those cards that are associated with the queens and kings of the court cards. Next, the type of card combinations are discussed. Here readers are briefly introduced to the idea of “near and far” in a reading that Andy Boroveshengra goes into in much greater depth in a subsequent chapter. He then takes the reader through a simple 5-card reading and the combinations found therein. Card order is of crucial importance when interpreting Lenormand cards and the author provides a good number of examples and proves that for Lenormand A + B does not equal B + A. Card order changes the meaning of the cards. Additional methods summarized include Counting, Mirroring, Knighting & thematic Chaining. The next section is all about Spreads and opens with a lengthy discussion of the Grand Tableau. Here, Andy Boroveshengra breaks the Grand Tableau down into manageable sections. Although at first glance the amount of information he provides appears to be a bit daunting, it really isn’t as long as the reader does not rush and takes time to absorb the methods discussed for each section of the Grand Tableau. A thorough analysis is provided of a sample reading for which the image of the spread is repeated throughout this section so the reader does not have to look back and forth between the text and the image. If one were to remove the illustrations this section would not appear to be nearly as lengthy as it does so don’t let this dissuade you from further reading. Once the discussion of the Grand Tableau is concluded other spreads discussed are linear spreads consisting of 3, 5 and 9 cards with information on yes/no readings. A discussion of the 9-card 3×3 spread concludes this section and includes two examples along with color illustrations of each spread. The main body of text ends on page 125, but Andy Boroveshengra also included appendices. Appendix I covers the life of Mlle. Marie-Anne Adelaide Le Normand that concludes with a list of resources for further reading. Appendix II covers the meaning when multiples of Lenormand cards with the same playing card association appear in the same reading. Appendix III summarizes timing indications of particular cards. Appendix IV is very valuable as it contains information about the author’s health combinations. Andy Boroveshengra gained knowledge of card combinations pertaining to health by doing readings for health professionals when he was a member of the NHS. Although untraditional, I have repeatedly discovered that his health combinations hold true for my readings as well. Appendix V contains a list of decks recommended by the author. Appendix VI lists online resources. Appendix VII is a translation of the “Philippe” Lenormand instructions for reading Lenormand cards. Appendix VII concludes the text. If you purchase Lenormand Thirty Six Cards and no other book you will be well-informed on how to interpret Lenormand cards and how to use the most popular spreads. Much of this information has been posted on Andy’s blog over the last few years. Prior to all these books currently available, for several years Andy’s blog was my only source of information when I was learning how to read Lenormand cards. I did just fine with his material as my only source. Lenormand Thirty Six Cards makes for an outstanding addition to anyone’s book collection who is truly interested in learning how to read Lenormand cards. I cannot recommend this book highly enough. My forthcoming Aloha Spirit of Maui Oracle deck. Next How to Choose a Tarot Deck.